Well that was a decisive opening round. The favoured one KIA on his first appearance! 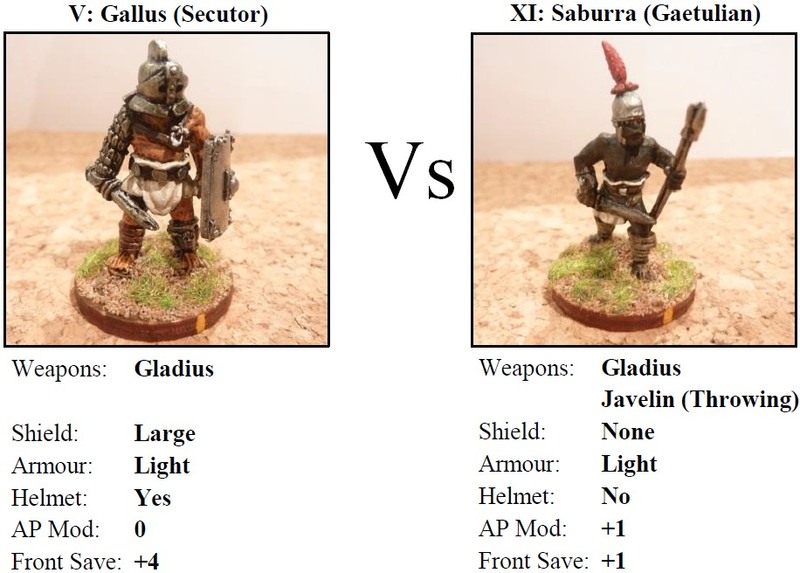 Let me know if you want me to start another gladiator from my poor start. As Gallus’s first skill, I will take Dodge, as I think he needs to improve survival skills at this stage. Ahenobarbus was not very happy about this initial showing, although considering it was only the matinee, not too much damage done ... The crowd saw a good fight with GALLUS and plenty of blood with SCORPU. And Ahenobarbus was able to make a quarter-aureus selling the dead body to the lion keepers. GALLUS earns 2 aureus for the day's work, which becomes his starting balance. And the Dodge skill, as you indicated. A few days later as Ahenobarbus was busy in a training session with ALUCIO, (another gladiator in the ludus who is subject to violent mood swings that affect his fighting capability) and wondering if the new herbal medication he had been told about would do any good, he got a visit from Helios, who he knew well, one of Athenodorus's slave secretaries and confidential general agents. Athenodorus was up for the prestigious office of City Aedile this year, but his main opponent, Paulinus, was getting traction and looked like winning. Now, if he could be removed before the election which is just after the Games ... He would be an easy target as he normally had no bodyguards and often visited an obscure temple, alone, in the early morning when no one was around. Ahenobarbus agreed, indeed he had no choice as a freedman client was totally expected to obey the commands of his patron. He would think about it later, after the Games. Ahenobarbus was grateful for this opportunity given by his patron, but nervous as his men lined up against opponents who were nominally superior in skills. However if successful the prize money would be lavish. One thing that is apparent is that the crowd of Antioch is not only hard to please but quite bloodthirsty! 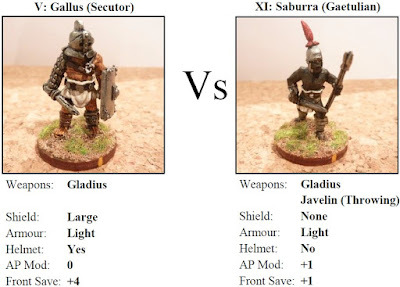 Gallus: lost 0 from 6, favour points 0. Won. Saburra: lost 6 from 5, favour points 1. Lost Appeal modified result 6. Dead. This was one of the best fights of the day, but again, the crowd was hard to work. Senecio started strong (why does everyone get the “jump” on Ahenobarbus’s gladiators?) and attacked a few times with many misses and only scoring 1 wound. He did get 1 favour in that time, which was poor reward for a strong opening. Gemanicus bided his time then came in with a strong flank attack doing 5 damage, injuring Senecio. But Senecio was one to never quit, despite the AP penalty on his wound, he drew upon the crowd support to just perfectly time a flank attack. It was a dismal miss, and Senecio was now “tired” (but not yet emotional). Gambling money was flying on Germanicus to close this out. However, the wily Senecio wrong footed Germanicus and got a 4 hit in, causing serious injury. 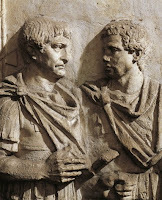 Germanicus recovered to get a few attacks in (all misses) and was on the brink of tiredness, but garnered 1 favour from the crowd for the fight back. Germanicus then came to life and had a powerful strike on the unshielded flank of the slowed Senecio with enough damage to win the fight, but the sword glanced off the helmet as Senecio’s armour held firm. Senecio then countered and struck Germanicus who fell. Germanicus: lost 7 from 7, favour points 1 (5 fatigue). Lost but survived Appeal. Senecio: lost 5 from 8, favour points 0 (5 fatigue). Won. The appeal roll was interesting here. The roll was 4. As Germanicus did not have a helmet it dropped to 3. It looked like curtains. 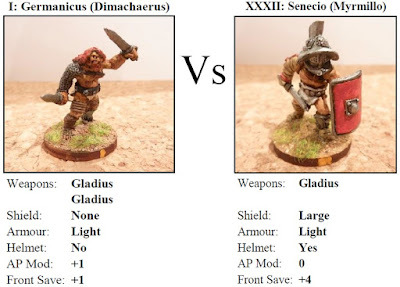 But.. +1 for being injured, +1 both gladiators tired or exhausted, +1 for injuring opponent, +1 for favour point. Just got to 7 to survive! Luckily Saburra was not spared, as the -1 from this would have finished Germanicus off. The next skill Gallus will choose is Attack.